A Golden Path Into Winter. It’s that time again and the brisk autumn air is cooling at the higher elevations. No matter where you go in search of fall color you can always find something if you are there a week before or after the main peak. If you feel you are too soon or too late just remember the color changes with elevation and temperature. While you’re following your fall color reports don’t forget to listen to your own intuitions, you might just find what you’re looking for. These beautiful leaves reminded of brand new fluttering gold coins falling to the ground. This photograph was taken a week after the main peak in the White River National Forest in Colorado. This entry was posted on September 20, 2010 at 12:02 pm and is filed under Uncategorized. You can follow any responses to this entry through the RSS 2.0 feed. You can leave a response, or trackback from your own site. So beautiful! I love Autumn, too bad we don’t get much of it in my country. 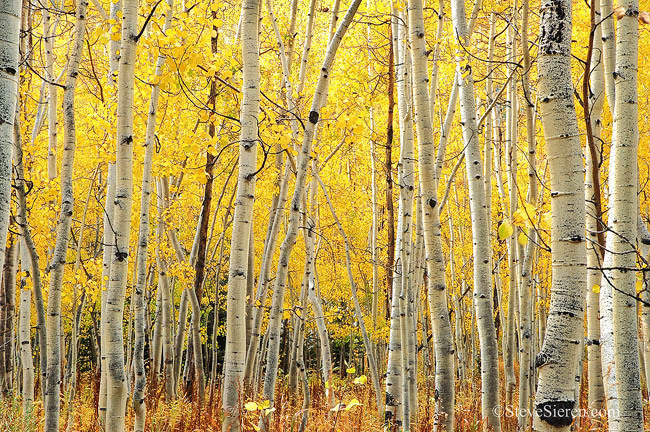 Gorgeous photo and stand of aspen. It just keeps on glowing. I love the title of this. Thank you guys! It’s the first week of fall, which means you’ll soon hear the familiar crunch of fallen leaves beneath your feet. But that autumn breeze blowing in also means that it’s about crunch time for your higher elevation to begin turning around in the Sierra! Rhoda, that title was just an idea I wrote down and made sure it went to use.